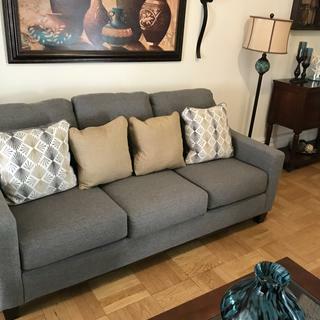 L: 80" x W: 38" x H: 37"
Hollister Sofa Cool and contemporary with a touch of mid-century flair, the Hollister sofa in graphite gray is great for relazxing after a long, hard day. The sofa has button-tufted accents and sloped track arms that go with the flow. The gorgeous gray upholstery with chenille-feel softness is complemented with solid and print pillows in butterscotch and gray. Cool and contemporary with a touch of mid-century flair, the Hollister sofa in graphite gray is great for relazxing after a long, hard day. The sofa has button-tufted accents and sloped track arms that go with the flow. The gorgeous gray upholstery with chenille-feel softness is complemented with solid and print pillows in butterscotch and gray. Frame joints are reinforced with corner blocks, heavy-duty metal fasteners, and glue for added strength and stability. I love this couch! Great colors to blend with grey and beige. It is also very comfortable! My salesman was friendly and helpful. The selection was incomparable. Customer service was stellar. I'm very satisfied with my purchase. Very comfortable furniture. Not too firm, not too soft. Fits the space perfectly with the look we wanted. Time will tell on how this will hold up. So far so good. Wonderful sofa for the money. The delivery was quick and professional with out damage to anything. Very happy! Great service and very helpful and polite..they were able to handle both my deliveries within the time frame given. Nice couch at the right price. Will certainly look at Raymour & Flanigan when buying future furniture. Comfortable and looks sturdy. Would recommend. The service and the support and all around experience was implacable. 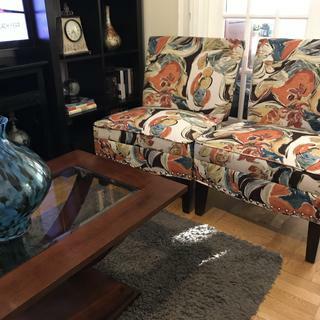 We purchased sofa, coffee table with the side tables, queen bed, chest and TV stand. I love the sofa, it is very comfortable and fits perfect in my apartment. Very happy with the purchase. Love it !! So perfect for our new home! Very comfortable and got tons of compliments on it ! Perfect for a small townhome. 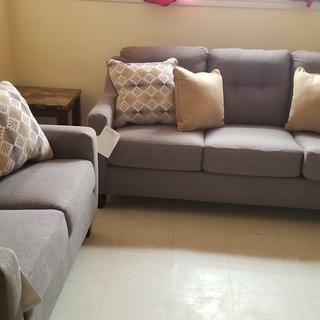 what is the minimum door width to accommodate this couch? BEST ANSWER: Hello Lauren! Both the Hollister Sofa and Sami Sofa have removable feet when delivered and should have no problem fitting through a standard door frame. Are the seat backs attached? BEST ANSWER: No, they are not reversible. This couch is so comfortable, you won't believe it. I also got the protection plan. Hope this helps. No. The sides of the seat cushions that aren't visible are made of a different material.